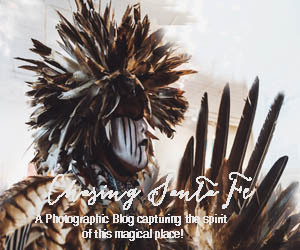 Welcome to Santa Fe Arts Journal, an online magazine focused on Santa Fe’s visual and performing arts community that’s written and curated by Emily Van Cleve, an artist and journalist with 24 years’ worth of experience writing about the arts for local, regional and national publications. Enjoy reading about select upcoming shows and performances in SFAJ’s LOOK, LISTEN and LEARN MORE sections below! Painter, writer and circus artist Lori Swartz spent two winter months in Buenos Aires, creating paintings featured in GVG Contemporary’s two-artist show “Surface Architecture” that opens on April 26. Although the tango has inspired many of the pieces in Serenata of Santa Fe’s concert “Red Tango,” the May 5 program contains quite a diverse group of compositions. The landscape has been Brian Rutenberg’s inspiration for decades, although it’s not literally painted in Rutenberg’s abstract works. Mantra-based music is presented at the Lensic Performing Arts Center when The Wings of Mantra World Tour 2019 comes to Santa Fe on May 3. Although photographer Natalie Christensen lives in the desert Southwest, she is mesmerized by swimming pools. “I am repeatedly drawn to the swimming pool as a subject of my photography because for me they are a metaphor for the unconscious,” she says about her work on Turner Carroll Gallery’s website. Teatro Paraguas presents “El Coquí Espectacular and the Bottle of Doom,” Matt Barbot’s play about a Nuyorican comic book artist down on his luck who becomes the city’s newest superhero. KEEP Contemporary’s 3rd Annual Abstract Art Invitational Group Show features a wide range of abstract and and surrealist work created by 25 artists, including Shakti Kroopkin, Dirk Van Lach, Sergio Moyano, Lea Anderson and Zac “Wonky” Hyde. “For me, the imagination explores the interaction between what is real and what can be imagined,” explains surrealist artist and poet J. Karl Bogartte, who has two works in the show. “Spaces in Between: Following the Route of Keystone XL” is 5.Gallery’s exhibit of Mary Peck’s photographs that document the route of the proposed Keystone XL pipeline. Gregory Horndeski enjoys celebrating spring by creating a group of paintings that convey his excitement about the approaching season. “Vernal Paintings” is Horndeski’s new show of spring-inspired work that opens at Horndeski Contemporary on April 12. Dwight Loop has had a lifelong interest in electronic and experimental music. He expresses his passion through writing original compositions, playing with his trio The Rampant Egos, broadcasting radio shows and presenting musical acts at Paradiso through his new No Compromise! 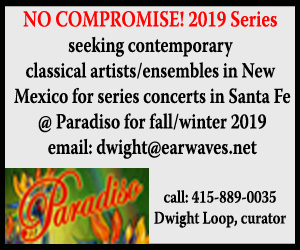 2019 series of concerts. Exploring a Tormented Mother’s MindTalia Pura's presents her play "Demons of the Mind"
Andrea Yates, a former resident of Houston, Texas who drowned her five children in their bathtub in 2001, was the inspiration behind Talia Pura’s play “Demons of the Mind.” Yates had suffered from severe postpartum depression.